Three things before I start. This recipe is the reason I started the blog. My Twitter friend Susan writes a lovely blog called ‘A Little Bit of Heaven on a Plate’. 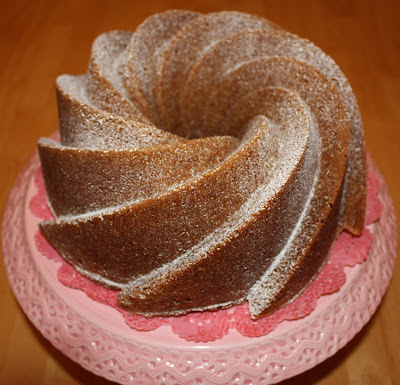 Over Christmas she asked me to to do a guest post after seeing my Spiced Bundt Cake on Twitter. I was convinced no-one would read it. People did, and were very sweet. Susan is my mentor ~raises glass~. This recipe started my recent bundt obsession. The reason it is called Matilda has nothing to do with any whimsical childhood literary memories. It’s because my husband said the tin reminded him of Matilda off Robot Wars. Really. Those of you who follow me on Twitter will know the pain I feel with every new recipe. I feel fear every moment of the cake’s creation until it is safely released from its tin. This is no exception. It took several goes to get this little monkey perfect, but now it works like a dream every time. Grease and flour a standard 10 inch, 2.4 litre, 10 cup bundt tin. Mix the butter and sugar until it is well combined (I use a hand mixer, but elbow grease and a wooden spoon is just as good). Add the beaten egg a little bit at a time until light and fluffy). Add the extracts to the milk and again add to the cake batter a little at a time. In a separate bowl, sift the flour, spices, salt and bicarbonate of soda. Add the dry ingredients to the cake batter a little at a time. Mix everything until its light and creamy looking, taking care not to beat the living hell out of it! Put this bad boy into the prepared cake mould and level off with a quick shake of the tin. Check your oven temperature is correct before popping it in the oven for about an hour and fifteen minutes. At the 60 minute point take it out for a nosy. Its stable enough to not sink so don’t panic! If a skewer comes out clean, your work here is done. If not pop it back in for about another 10-15 minutes (Note for other OCD sufferers - this is a very forgiving cake and is very hard to over-bake). The top will look quite dark, but this is a beautiful firm base to the cake when finished. Once cooked through leave the cake to cool in the tin fully. I mean fully. When cooled dust with icing sugar to decorate, I find a tea strainer quite useful here! It really picks up the shape of the tin.